I was so happy to have them back in my life, I truly adore these two. What I wasn’t expecting is what hit me on page one, Monica and Jonathan are broken. Sooooo very,very broken. My chest was in pain and the worst part about it all… the reason… is real. This was the type of broken that needs time to heal, it needed to have Neosporin rubbed on top of it three times a day in order for it to heal. Well, thank God for Jonathan being the KING that he is...he took care of the situation! Once he figured out the cause of the issue, he made an active attempt to get them back on track. These two love each other deeply and that’s something I’ve always felt from the very beginning of their story. 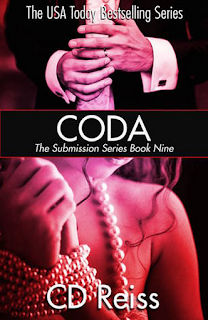 CODA is just another example of why they belong together.